Often the best travel experiences are the ones that take us completely by surprise. Visit St. Peter’s Basilica in Rome, and you expect to feel a sense of wonder. The builders went to great lengths to shape light, art, color and space to create a spectacle that will fill the visitor with awe. The Buddhist temples of Bagan, the Blue Mosque, these places were designed to encourage transcendent experiences. That’s what they’re for. But you don’t really need them. The real cathedral is all around us. And you can catch a glimpse of its outlines in even the most unlikely places. I’m sitting in an outdoor restaurant in Istanbul’s Sultanahmet sipping mint tea and enjoying a hookah of strawberry tobacco. It’s a gorgeous moonlit night coming on, with the last rays of the fading light casting shadows on the curved dome of the mosque just beyond. The evening call to prayer has already sounded, and my wife and I have chosen this place at random to relax for a bit and mull our options for the remainder of the night. Suddenly, the soft strains of music announce that the floor show, whatever it is, is about to begin. I idly expect musicians or dancers or perhaps both. I don’t much care what it is, just happy to surrender expectations and let Turkey come to me. And what comes, surprisingly enough, is prayer. A local man next to me murmurs that a young member of the Sufi religion, a Whirling Dervish of the Mevlevi order, is about to take the stage to perform the trance-inducing, dance-like act of worship called the Sema. A stranger’s spiritual meditation, his attempt to reach religious ecstasy, is to be our evening’s entertainment. 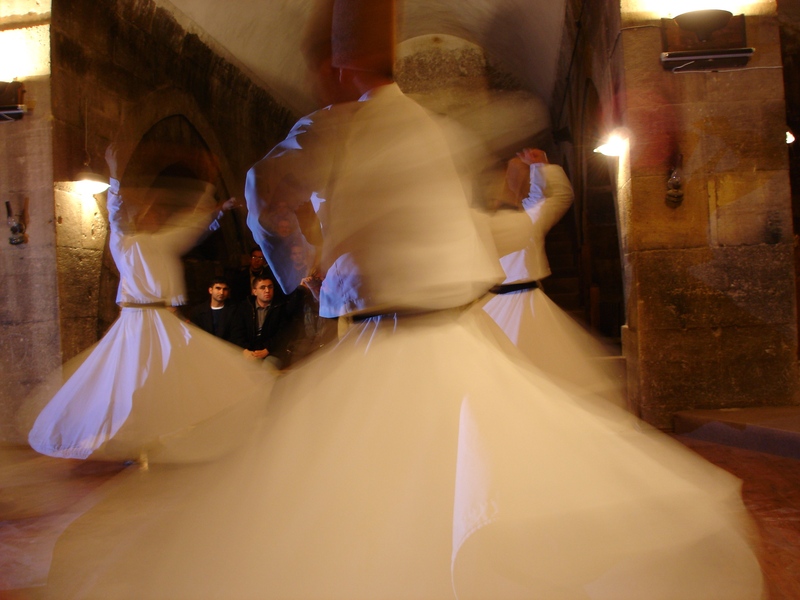 For years, the Turkish government forbid Sufi worshipers from practicing their religion. When the government finally relented and began to allow public performances of Sufi prayer, it was not due to some fresh blossoming of religious tolerance but because of its value to the tourist trade. As we wait for the performance to begin, my mind is suddenly busy with questions. How would you pray if you were on stage before an audience that had come, not to join you in prayer, but to witness it as an outsider? Would you actually pray, and attempt to commune with something greater than yourself? Or just go through the motions? Would people be able to tell the difference? What if our roles were reversed? What if the café management trotted me out to perform the Lord’s Prayer before a crowd of curious Buddhists? Or brought out a Catholic to count the rosary for an audience of Muslims? I can’t help but feel a growing discomfort with what I imagine to be the dynamic at work here and my role in it. While I’m looking forward to having my questions addressed by the performance, I’m also ready to disapprove of whoever this person is, that they think so little of their intimate connection to the divine that they’d trot it out for a tourist show. As I wrestle with these thoughts, the Sufi worshiper takes the stage. 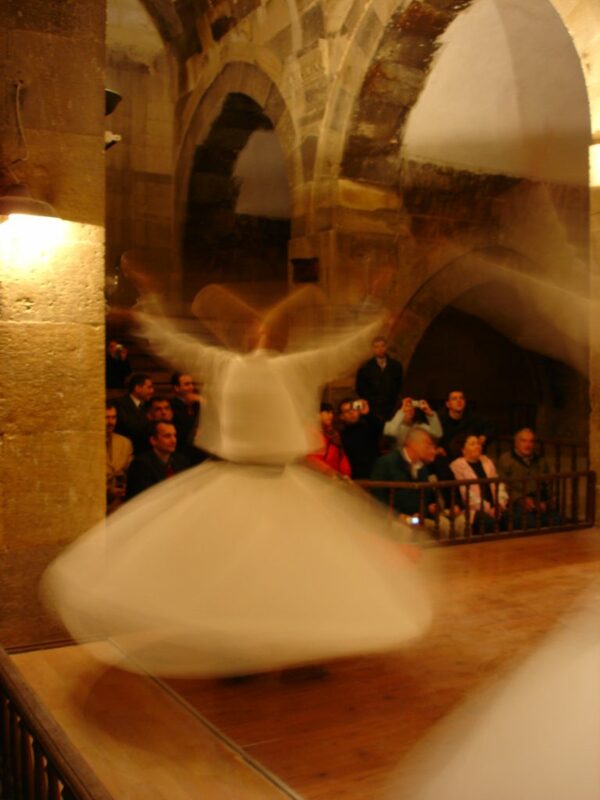 The young Sufi wears the traditional, long, loose garb of his faith; a wide, white skirt, a long-sleeved white frock, a black cloak, and a camel’s hair conical hat that symbolizes the tombstone of the ego. I scan his face to get a sense of what he must be thinking, expecting and dreading any sense of showmanship, a big smile, or perhaps a feigned intensity to communicate a solemnity he doesn’t actually feel. Instead, his features are perfectly composed, his bearing humble, his movements modest and small. He doesn’t greet the crowd or otherwise regard us. In short, he does not appear in any way to be a man on a stage. Then a slow, gentle cascade of plucked strings from a lute-like saz and the guitarish oud fills the small square with a delicate, crystalline tapestry of sound, and the Sufi begins to move in response. Falling in time with the music, the worshiper closes his eyes and begins to slowly turn counter-clockwise in place, his feet making careful, practiced movements that bring him around in a small, perfect circle, his arms crossed over his chest. As his circling accelerates, his hands slowly draw up his body, as if energy is welling up inside him, as if he is a funnel cloud touching down on an ocean, pulling water from the deep, and directing it upward, connecting earth and sky. The pace of the music increases, and his arms rise higher in the air as he whirls faster. He holds his right hand aloft, palm up, to receive God’s love, and turns his left hand down to shower that love upon the world — upon us, the witnesses to his prayer. He tilts his head slightly to one side, toward the hand that is reaching out to Heaven. He leans into his turning, falling into space but never landing, circling around his heart, sending the edges of his white robes spiraling outward around his deftly shifting feet. He gives himself over completely to the act. He is with God. And through God, he is connected to everything, including us. It is beautiful, and we’re riveted, all of us. But we’re not an audience; not anymore; we’re a part of it somehow. He has made of himself a divine antenna to tune into a hidden wavelength in the air and selflessly, unconditionally share it with us. I realize that my wife and I are holding hands. Others around us are doing the same. Unbidden, my left-brain suddenly intrudes on this magic moment. It whispers that all religions incorporate some form of repetition into their rituals to help induce a trance state in their followers. It reminds me that repetition frustrates the left brain until it gives up and calls it a day, allowing the right-brain to lead for a while. My left-brain argues that this young Sufi has used his endless physical repetition as a vehicle for trance and, in doing so, he has made his whirling body into an instrument to transport all of us that watch him to that same pure place, like swinging a shiny object back and forth in front of a subject until they’re hypnotized and laid bare of all artifice and conceit. Maybe my left-brain is right. But I don’t care.What matters is that, whether it’s due to some mystical connection to the divine or merely a quirk of our human biology, for this moment at least, a gathering of strangers has been transformed into a community. And we are a part of it. I have seen a city of Muslims fall upon their rugs in response to the ringing out of the call to prayer from ancient minarets as it echoed out across the rooftops. I have heard huge choirs fill Christian cathedrals with magnificent praises to the glory of God. I’ve kneeled to the chime of bells with Buddhist priests and joined in contemplation. I’ve broken bread with Jews to thank God for his Sabbath. But to this day, I have never seen a simpler, more authentically reverent expression of prayer than I beheld that day. And I came upon it at — of all places — an outdoor café. 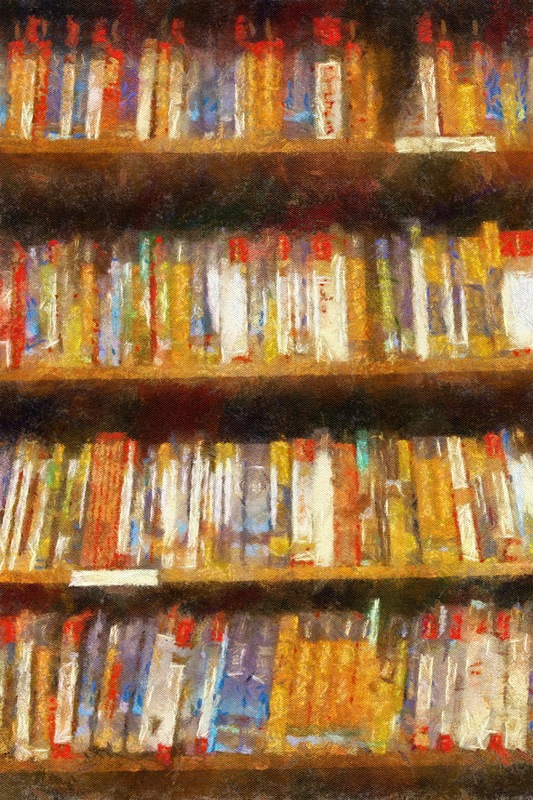 If you make yourself available to wonder, you can sometimes find it in even the humblest places — in the middle of a cornfield, on a subway platform, or at an outdoor café catering to the tourist trade. Discovering wonder in the wild is somehow more exciting than experiencing it in a church, a temple, or anywhere else designed by the hand of man to elicit that response. It affirms that we cannot confine wonder with the places we build to frame it. It will not be fenced in. Wonder is all around us, all the time, and to receive it we need only turn toward it. 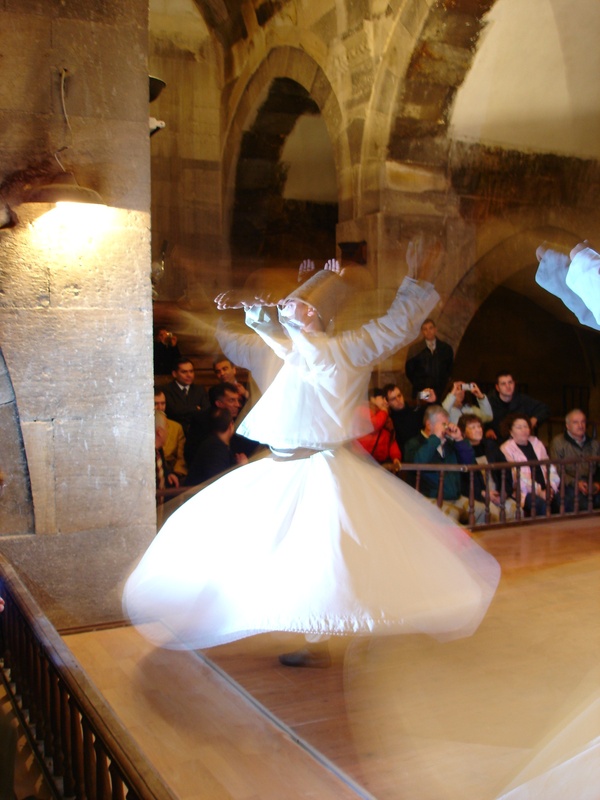 NOTE: If you enjoyed Travelers Roundtable contributor Kevin Revolinski’s photos for this story, read his own account of witnessing Sufi dancers in Turkey as well as a story about women dervishes, both at TheMadTraveler.com.